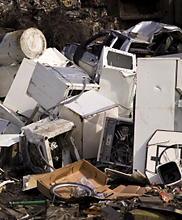 Have you got non-ferrous scrap metal lying around at home or at your business premises? It could be anything from old aluminium metal to scrap copper cable and we’ve got top prices waiting for it. Having been in the ferrous and non-ferrous scrap and recycling business since the 1990s, we’ve built a successful business on fast, efficient scrap processing and paying competitive ferrous scrap prices – whether you come to our Gloucestershire depot or we collect. 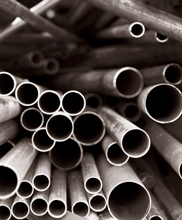 For latest non-ferrous metal prices, call 01451 820 230 or email us. What’s the difference between ferrous and non-ferrous? Maybe you already know the difference. But just in case you don’t, here’s a quick introduction. Stainless steel is a ferrous metal because it contains iron, but is often classified as a ‘non-ferrous metal’ by the scrap metal industry. That’s because of its non-magnetic properties and their implications for material handling while recycling metals. Regardless of whether you consider it non-ferrous, we pay top prices for stainless steel! 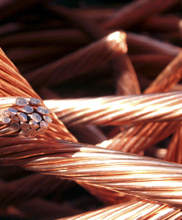 Call 01451 820 230 for competitive copper prices today. How much do you pay for non-ferrous scrap metal? As for all metals, non-ferrous metal prices vary daily, which makes it difficult to publish an accurate price list or anything as specific as a brass or copper price chart. Instead, please call or email with details of the metal you are selling. Whether you’ve just cleared out your domestic garage or a large industrial site, we’ll make sure we give you a competitive price. As one of Gloucestershire’s long-established, fully licensed scrap metal dealers, we’ve built a reputation on fair scrap metal pricing. 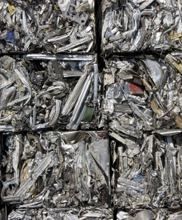 Unlike some scrap metal dealers, we’ve always taken a responsible approach to metal recycling. We welcomed the Scrap Metal Dealers Act 2013 that was passed to eliminate cash transactions and tighten control of our industry in everyone’s interest. Because of this, we can no longer pay you in cash – but we’ll pay you with a cheque or bank transfer instead. You may be surprised how much money you can raise whether you drop your non-ferrous scrap off at our depot or we collect it from you. 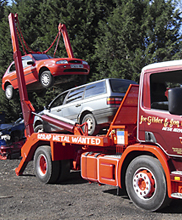 As well as accepting deliveries at our Bourton-on-the-Water scrap metal yard, we can arrange a one-off or regular scrap metal collection. We’ll even supply skips to help you sort your scrap. Want a great aluminium-can scrap price or current copper prices? For the latest non-ferrous scrap prices, to discover what we’ll pay for your unwanted items, or to arrange a convenient collection, please call 01451 820 230 or email us.